» Online Review: Why Should You Care? Online Review: Why Should You Care? When you travel, how do you determine where you stay? If you are like most consumers, you are likely to turn to friends, family, and acquaintances. More and more travelers are heading to virtual strangers for recommendations. According to a 2007 Bridge Ratings Survey, consumers are much more likely to turn to strangers with experience for information than they were ten years ago. No longer does the rule of “make a customer unhappy and they tell 7 acquaintances” apply. Today a consumer can share their experience with 7 million people on sites such as Trip Advisor, on their personal blog, and/or on third party travel sites. 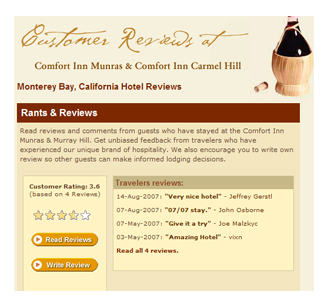 One way to allow consumers to share experiences with other “strangers” is to offer a customer reviews page on your hotel website. A review page allows consumers to generate content for your site and share opinions about your property with other potential travelers. Not only does user generated content help your search engine optimization efforts, but having unbiased reviews on your site can help sway on the fence consumers from lookers into bookers. Article contributed by Tammie Carlisle, Milestone Internet Marketing, Inc.